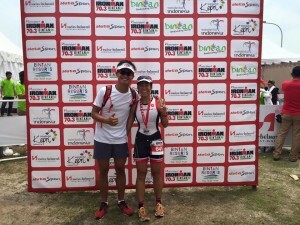 Race Review: Ironman 70.3 Bintan (by Ginni Chan) | JustRunLah! 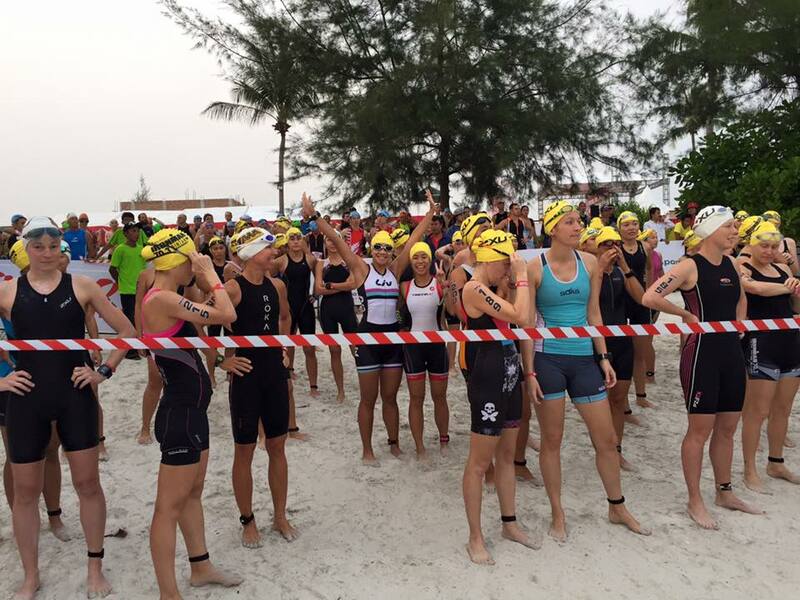 It was a wonderful weekend in Bintan, more so for participating in the Ironman 70.3 Bintan race. This is my third 70.3 event and as the sayings goes, ‘third is a charm’ is indeed true. Due to many factors such as proper nutrition, double training sessions, good weather and racing with a more relaxed mindset, I achieved a personal best time of 6hr 9min compared to 6h 32min in Da Nang in May. I was pleasantly surprised and satisfied with my race result and felt relatively comfortable during the race (Maybe i should have pushed much harder hur). So here’s a pre-race and race day recap. Arrived in Bintan on Friday evening together with my training buddy, Elaine. We stayed at one of the SAF villas at Bintan Lagoon Resort instead of the Swiss-bel Hotel, which was the official hotel partner. My other training buddy, Flora, arrived earlier in the morning together with her family and she was “in-charge” of our nutrition plans. She had prepared some beef bolognese sauce at home and we had beef bolognese pasta for dinner, which tasted AWESOME! Saturday morning was an easy spin around the resort area to test our bikes and make sure it is functioning well. 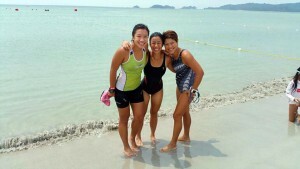 We headed over to the race venue at Swiss-bel Hotel in the late morning to collect our race pack and had a swim recce. However, I felt that the race pack collection expo was disappointing with only a handful of race partners selling their merchandise (KPI, PURE Nutrition, Flight Centre and another two to three booths). 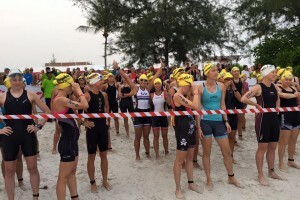 With the limited number of booths, the Ironman 70.3 Bintan merchandise was limited in both quantity and variety as well. With that, the race goodie bag was equally miserable too; not many freebies. A bottle of energy drink, a PURE Nutrition water bottle, race booklet, vouchers for Swiss-bel Hotel, Singapore Aquathlon brochure and that’s pretty much. This is a far cry compared to what I had received in Da Nang and what my friends received in Cebu. The entire race expo was quiet with only chit-chats from the participants, so the hype wasn’t really there. I believe the organisers have the ability to provide much more in the goodie bag, and hope to see more goodies (not brochures) in future race events. Swim recce was good – clear and calm waters. However, the tides were very low – even after swimming for about 100-150m, we could still stand in the water. Had a simple lunch – Beef burger with avocados before fetching my husband, Alan from the ferry terminal and we had a short rest in the afternoon. Headed back to the race venue to rack our bikes, attended race briefing and carbo-loading dinner. Carbo-loading dinner was disappointing as well. The food was not properly cooked for e.g. fried rice was under-cooked, the pasta was too hard and too dry, the fish was not thoroughly cooked, the chicken was dry, the soup tasted sour, and etc. Maybe the hotel was not ready to handle such a massive crowd. Headed back to Bintan Lagoon to pack our bags and get ready for RACE DAY! Breakfast was different from my usual and I had a slice of bread with avocado and eggs. I took a banana with me and ate it before the swim start. The transition area was almost pitch dark as the lights were not functioning well. I think a lot of the athletes including myself were having quite a trouble trying to pump the bike, test the bike computer is working and arranging the transition area stuff. Once done, we walked to the swim start for a warm-up swim before our wave. Elaine and I were in Wave 4 while Flora who was doing the Blitz category would have her swim start at 8am instead. The tide was low that morning and the start of the swim was pushed further back into the sea. We watched the Pros start and they ‘dolphin-dived’ through the low tides before changing to freestyle swim. As I couldn’t do “dolphin-dives”, I decided to swim freestyle in the low tide which was better than wasting energy running through the water. Swim: *Beep* The horn goes off and there I was, starting my third Ironman 70.3 race. I usually dislike the start of the open water swim because it can get very messy, and being an average swimmer, I will always be in the middle pack where people will shove you, kick you, overtake and etc. Through the swim, I bitten by sea lices and stung by a baby jelly fish on my arm (which I thought was a sea lice bite, ignored it and only noticed it after the race). 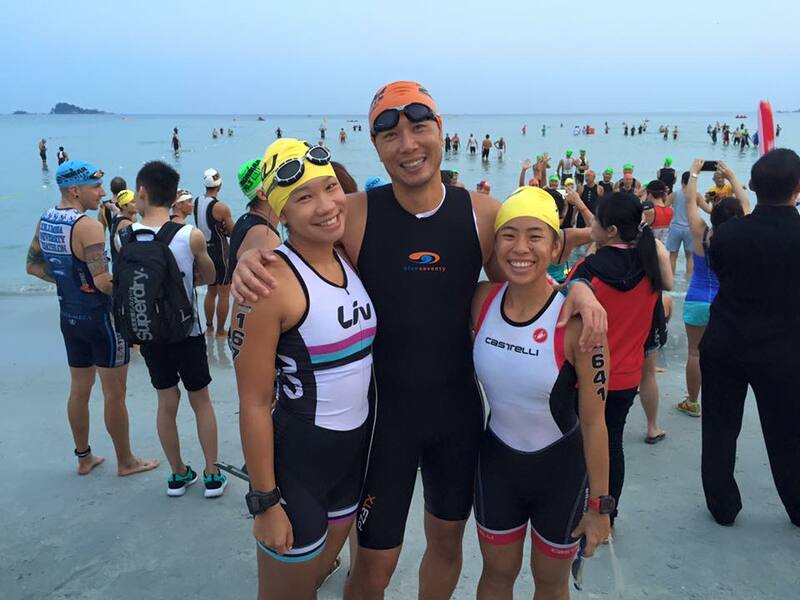 Out of the swim and into T1, I saw Alan and Flora standing at the side cheering for me; which spurred me on. 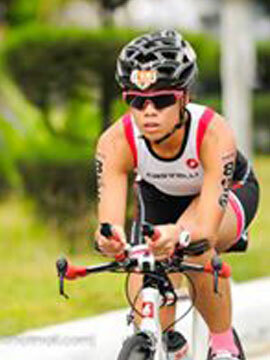 Bike course: Bintan, as it is famous for, are HILLS. So the 90km bike course was rather hilly, but with every up-slope there is a down-slope, so yay! Nutrition was important, so I had a few sips from my gel bottle every 10km – I had prepared my gel bottle with four packets of gels and diluted it with water so it is easier to swallow. I thought the bike course would be lonely since it was a one-lap course. But I was wrong. Along the way, kids would come out of their house and cheer you on! Some kids waved and wanted a “high-5”. But I didn’t return “high-5s” to them as I was worried I would fall, so I lifted my hand a little from the aerobars and waved at them. The kids loved the bottles too and kept shouting ‘bottles’. So i recycled the two bottles from Da Nang’s race and took one other bottle back. I was slightly off-target where my average speed was 27.9km/h where I was hoping for >28km/h. I told myself it was OK as I could save my legs for the run. T2: Changed out of my bike shoes to my runners, wore my visor, took two packets of GU energy gels and ate another two pieces of chews. Run: Three-loop course around the lake. I did a 2h 39min for the run leg for my past two half Ironman races and I wanted to do better. So I paced myself properly and started slow even though I knew I could go a little faster. I told myself I would only walk through the aid stations and to eat my gel at the end of the first and second loop. It all worked out well, and I did a 2hr 11min for the race leg. I felt good during the run and it was a different feeling as compared to Da Nang and Putrajaya. The weather was good as well, it was sunny, but there were clouds and it was breezy too! Throughout the entire race, Alan was our biggest supporter, snapping photos/videos and cheering all of us (Elaine, Flora, Louisa, Helmut, Noah and etc)! I came in sixth position for my age group of 12 participants. Elaine came in 3rd and attained a place in the World Championships in Sunshine Coast next year while Flora came in second in her age group for the Blitz distance, and I was really happy for them. My next goal is probably to try another 70.3 distance for a chance at World Championships? Till then, I am going to rest for one week before the grueling training for the IM WA begins! 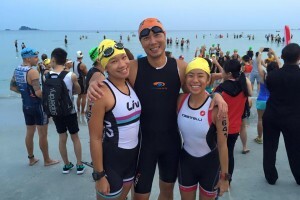 All in all, I enjoyed the Ironman 70.3 Bintan race! Very well done, girls ! Well done on you race. Is there an email address I could reach you on? Planning to do Bintan in 2017. Would be nice if you could get in touch.